We're excited to introduce another author who is making his debut after having used Novelize to write his first novel. Of course, Novelize is just one tool in this writer's arsenal. National Novel Writing Month gave him the push he needed to take writing seriously. 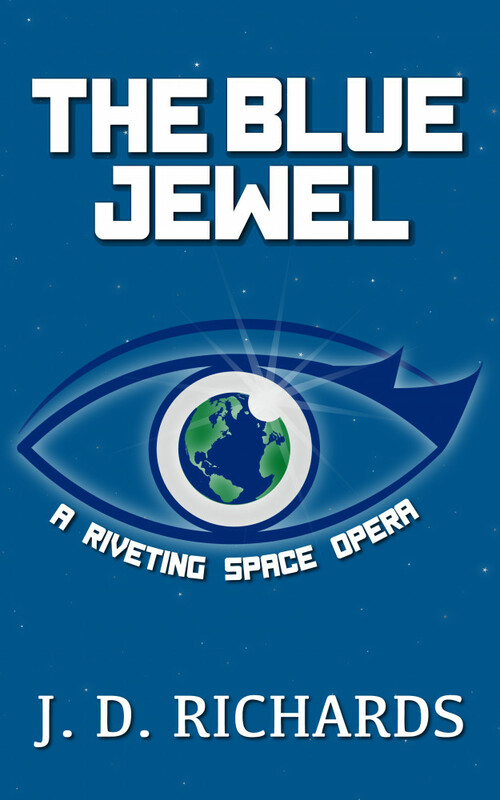 Here, we got a chance to interview him about his recently released space opera The Blue Jewel and ask him about his writing process. I had always wanted to write a novel. I loved reading books as a kid but fell out of the habit as a young adult when I felt I was too busy with other things. After re-discovering my joy of books I wondered if I could ever write anything worth reading myself. My sweetheart suggested I participate in the National Novel Writing Month (NaNoWriMo) challenge in 2017, and it seemed like the permission I needed to try. The Blue Jewel follows a young man named Cal on his adventures across Arizona and the Southwest United States to rescue his family. Calvin's world had been colonized by alien conquerors a couple generations before his lifetime after The Great War. He is immediately thrust from his peaceful village into the conflicts between the aliens, human rebels, raiders, and everything in between. Cal desperately navigates the complexities of his world as he overcomes his own anxieties and insecurities. Tell us about your writing process. How often did you write, and how did you make time for working on your novel? My writing process started a couple months before the November NaNoWriMo challenge. I began by fleshing out a rough outline of my story idea and filling in the notebook sections in Novelize. Novelize was perfect for me - I could easily catalog all the swirling thoughts in my head about characters, settings, storyboard, conflicts, etc. I was such a geek about it - I even took several personality tests as if I was each of my main characters so I could breathe more life into them. I documented that too in Novelize. I began the actual writing on November 1st of course (no cheating! ), and wrote for a couple hours each night. My sweetheart was very supportive of me as it soaked up most of my free time in the evenings. I used Saturdays to catch up. It was rough, but being able to work anywhere with WiFi with only my Chromebook and Novelize was great. I hit my 50k words just before midnight on November 30th (I won! ), but my story wasn't finished yet. I scaled things back a bit, and finally finished the book just before New Year's Eve (my second goal). My preparations before the actual writing worked out for me. The story still seemed to develop into its own creature even with all the planning, but I was grateful to have all my notes organized side-by-side with my writing on Novelize. Yes! I started writing The Blue Jewel just to see if I could, but by the end of it I realized my work was actually pretty good and the process was fun. I've been reading a lot of classic Noir murder/mystery books, and thought it would be fun to try out that style of writing. I keep a journal to collect new book ideas, and I look forward to writing more. Will there be a sequel to your novel? Maybe not a direct sequel, but there are other stories I would like to tell in the same universe as The Blue Jewel. I loved my characters and am not ready to send them back into harm's way just yet. How did you hear about Novelize? I stumbled into Novelize after doing a lot of research on various writing tools. Novelize offered the best feature-set for my needs. I'm glad I found it. How did Novelize help you write your novel? 1. Portability - I required something Cloud-based so I could take my little Chromebook to a quiet corner of the library and actually get some writing done. 2. Organization - Having all my outlines, character profiles, and notes on settings and plot tethered to my actual writing, but not in my face all the time was key. The way Novelize supports the Author's Notebook is incredible. It's all my ideas nice and neat, out of the way, but still accessible. 3. Accountability - I secretly hated loved the weekly email reminders showing me my word count and how I was doing on my goals. The word-count progress bar was a great writing companion. 4. Security - Having a Cloud-based writing solution was great. I didn't have to worry about losing my work if my laptop was stolen or destroyed, and I could still download a backup copy each night. Do you have any tips for other writers who are just getting started with their first novel? Don't compare your first draft to someone else's final copy. Just read a lot, write a lot, and edit a lot. Your voice matters as much as anyone else's, and all talent requires refinement.